Hasta la vista, baby, its parody time! When you think of the 80’s, one of the things a lot of us think of first, is action movies and those who starred in them. From Arnie the Terminator, to Stallone as the lethal Rambo, there was no shortage of action films and action heroes and yet, it wouldn’t be until this century that we would get to see so many 80’s stars gathered together under the same roof, only I’m not talking about The Expendables and its sequels. What I’m talking about is Cypronia’s Pixel Action Heroes, a voxel FPS game that takes the heroes of yesteryear that released on Switch recently. What might look like a Minecraft clone on the surface is anything but. Pixel Action Heroes is a game deserving of some attention, especially if you put in a lot of time playing Minecraft and harbour a desire to shoot the heck out of anyone you see and anything you create. Wait, create? Yes, that’s right, create. 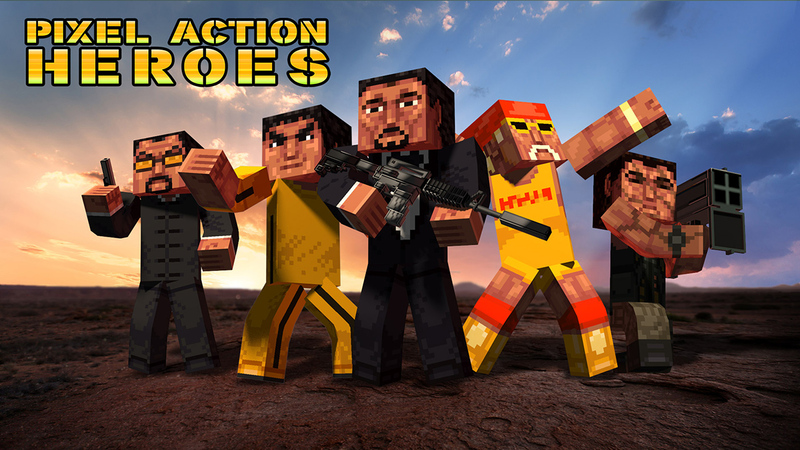 Thanks to a level editor mode, any and all willing players who pick up Pixel Action Heroes, can create and edit their very own maps, which can be shared with others, but there is also a skin editor so players can alter characters as they wish, alter cubes and even create their own custom character. Although, you can always stick with the characters in their original skins, be it Classic, or Enhanced, which puts even more details on famous characters and actors we know and love. In Zombie mode however, while day and night can be toggled, there is no altering the number of lives you have and the only way to gain access to the Bonus levels, is to complete all the non-bonus maps, via surviving Waves 20 and 40, with every 10th wave featuring Boss zombies to contend with as well. The actual gameplay for the two modes however, is the same. Players must use the left analog stick to run, the right stick to aim, L to jump or dive when in water and ZR to fire. Both modes also feature pads here and there that players can go to, to acquire new weapons, body armour and med kits, with the likes of the Y and A being used to cycle through them until you get to the one you want. Still, just because ZR will fire and X allows you to drop the item you’re holding, you will need to press ZL to create and use the medkits in your possession. There is some variety to the zombies you will face, especially when playing a different map, but if I’m honest, even though I could play as any character I desired out of those available, I personally found the single player campaign a tad too boring, as it did not hold my interest. What did hold my attention however, is the Online Multiplayer mode. Still, they’re not the only benefits of making your own room, as you can also implement any requirements you wish, in the way of deciding on the maximum number of people your room requires before a game can be played, you can even change the map and set the match duration. Although when you do get round to actually playing, there are a couple of differences compared to playing single player. For starters, the weapon you will use in battle, is based on whomever you’re playing as, so if you happen to play as Duck Morissett (aka Chuck Norris, who is so hard, he makes onions cry when he cuts them,) you will wield twin Uzis, whereas Bruise Leaf has a sniper rifle and Silver Stand has a not so mini-gun. But on top of that and all weapons being based on real-world arsenal, your characters will actually automatically move, with the right analog stick helping to give them a push in the right direction. So when playing online again others, you won’t ever have to worry about moving and shooting, but you will still need to pay some attention since your character will walk in the direction they are facing and you will need to be facing your enemies in order to kill them. Just don’t go forgetting that gyro controls are supported and they do come in handy. As for a reason why you should play the online mode, other than it being the best way to play and a lot of fun, players can rank up. There is a leaderboard and the better you do, the more likely the whole world, or at least those who have Pixel Action Heroes, can see just how great you are at this Minecraft-like shooter! If you’re looking for a Minecraft-looking title that comes packed with gun-toting action and zombies, Pixel Action Heroes is the game for you. Even if level creation doesn’t appeal to you and the single player stuff is just too boring, Pixel Action Heroes is actually a pretty decent online multiplayer game. Online really is the best way to play it and you will certainly get more out of Pixel Action Heroes by playing with others than you would by playing on your own.